In November 2015, our Boy Scout troop selected Wildcat Mountain State Park as our destination for May 2016’s monthly campout. 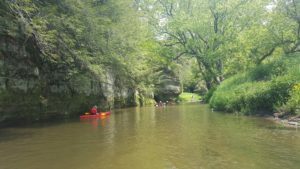 Due to it’s proximity to the Kickapoo River, we decided a day trip down a section of the river would be fun. 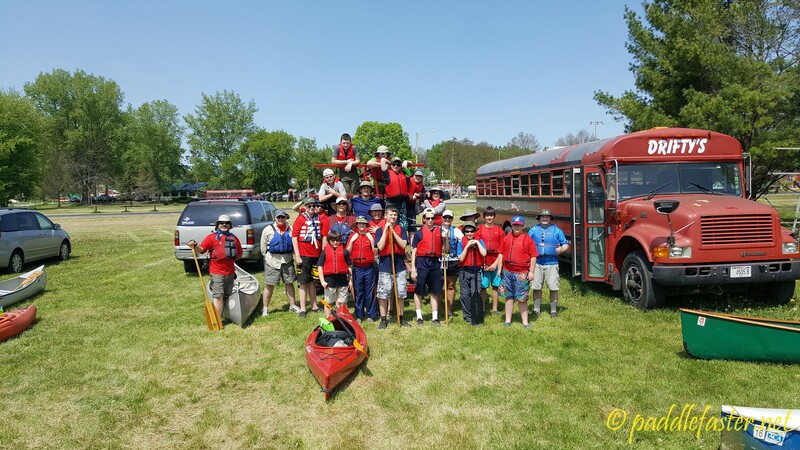 We’re lucky that our troop has a canoe trailer outfitted with a good selection of paddles and PFDs. Added to the mix are a couple of personal watercraft and that was the fleet for the weekend. We pulled into Wildcat Mountain State Park around 9PM and quickly settled into our group site. There’s at least one other Troop here this weekend and they have their own school bus! 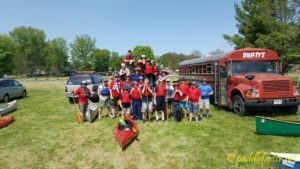 We’ll later learn that this was their annual Webelos training campout and some of the scouts would be going on an overnight backpacking hike the next day while the rest stay back for the training. Basically ILST for Troops incorporated into a campout plus basic Scout skills one must learn to progress through the lower ranks. We’re blessed this weekend with beautiful weather for later in May – nighttime lows a little under 40 and Saturday will hit over 80 while we’re on the river. The current is about perfect too, with the gauge in Ontario hovering around 60 CFS. At this speed there were a couple riffles that were fun to shoot and other than in those tighter areas the current was rarely noticeable. 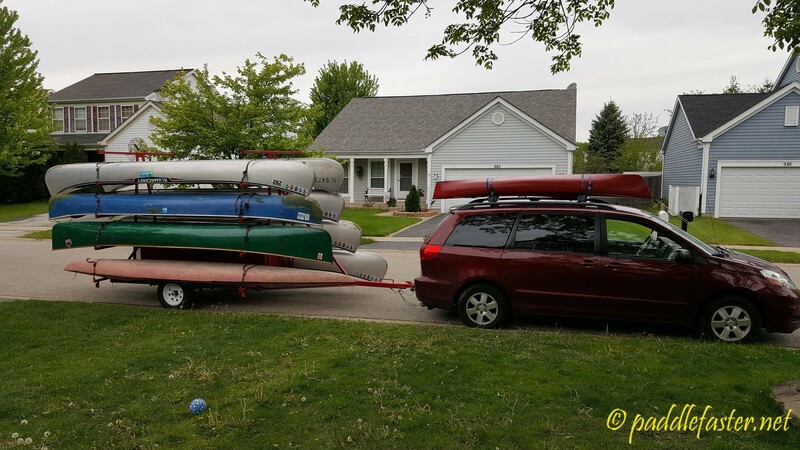 We put in at Drifty’s Canoe Rental after shuttling a return vehicle to our take out point a little more than 8 miles downriver at Bridge #7. The put in here is narrow, no more than one, maybe two boats can launch at a time. and we plus the couple other groups that have come, quickly form a chaotic line for getting launched. 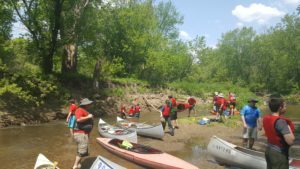 Getting all the Scouts launched takes a while, and our group is immediately split up on the river. 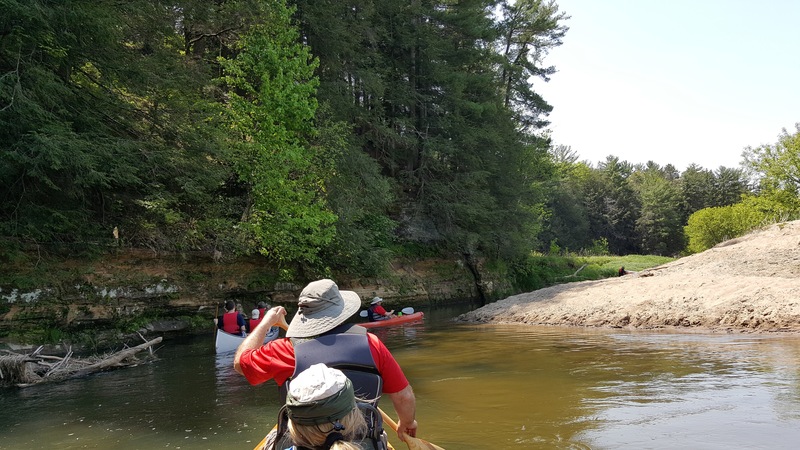 I have no idea how far ahead of us the lead canoes are – not good. I’m one of the last canoes on the river for our group, acting sort of like a sweeper to make sure no one gets left behind. 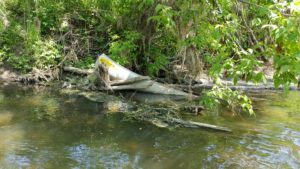 Shortly after getting underway we encounter this poor canoe, half sunk & the hull is wrapped around something. I wonder how long it’s been here & what was the event that caused it to end up like this? 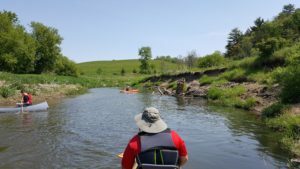 The Kickapoo is an interesting river to paddle. 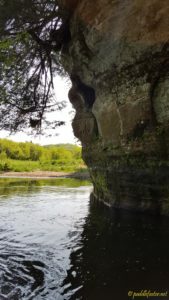 It’s in the “Driftless Area” of West Central Wisconsin, a part of the state that went untouched by the effects of the glaciers during the last Ice Age. 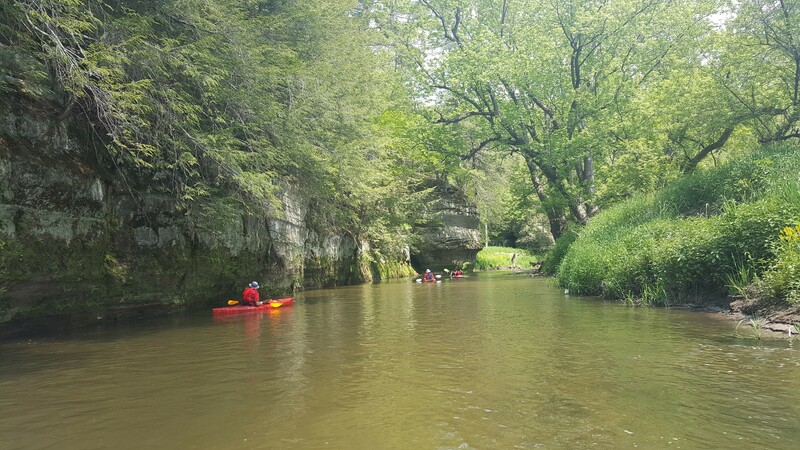 At times you may be paddling on the edge of rolling farmland, and then a towering sandstone bluff rises up and forces the river to turn at a 90 degree angle. The area has belonged to this river for millions of years and the slow march of erosion is evident wherever you look. The river winds and curls, sometimes doubling back on itself as it meanders from its headwaters towards where it empties into the Wisconsin. 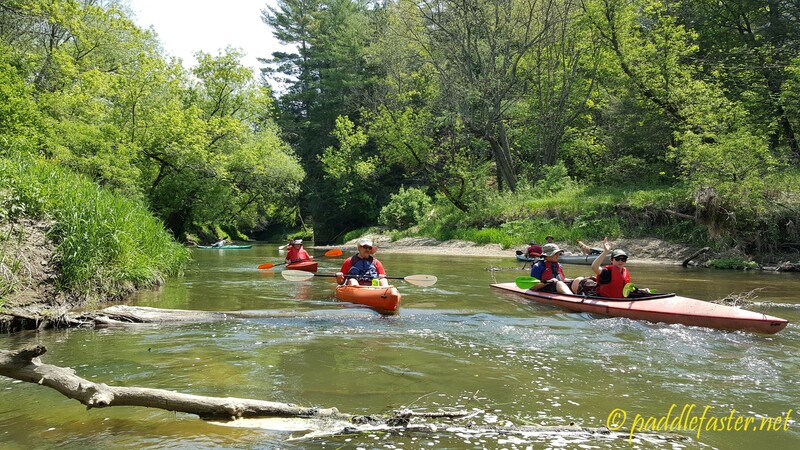 Eventually our group tightens up on the river and the lead boats stop at a sandbar in the middle of the river. It seemed like the perfect stop to stretch, eat some lunch, and discuss the 2nd half of the river. Everyone is in good spirits and enjoying the trip. The rest of the trip on the river goes well. 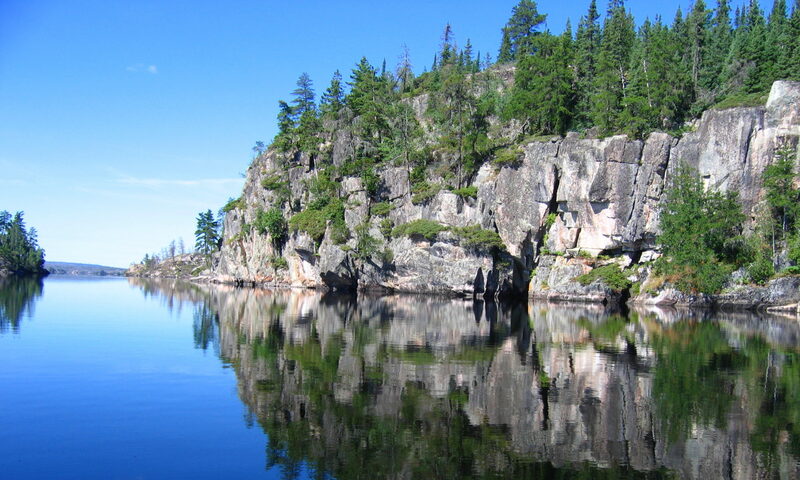 We continue to see the same lush landscapes as earlier, juxtaposed with imposing bluffs rising from the river’s edge. We encounter a few riffles on the trip and some of the watercraft in our group take on water, and others end up going for a swim. The spring Sun is warm, however, and it counteracts the cool temperature of the river. About a mile upstream of the Bridge #7 landing we encounter our only real difficulty of the trip – a partially submerged tree at the same spot where the river tightens and makes a turn. My partner and I try to negotiate it, but miss the turn and the current pulls us under the arch of the trunk and dishes us out into the river. We laugh, because what else can you do, and secure our belongings. The canoe is hurriedly dumped and we perform the paddle of shame to the take out. The drivers are dispatched back to the start to retrieve cars, and the Scouts quickly get things organized so we can load up the trailer when it arrives. All in all it’s taken us 4 1/2 hours to travel the 8.3 miles down the river. Figure that we had a 30 minute stop at that sandbar, and we did the trip in the average amount of time. This was a great time and a really pretty area of the state to visit, and hopefully we return to check it out in the future. 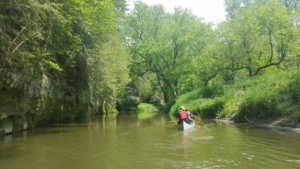 There are other trip options also available on the river, with several sections being able to be done as a day trip. 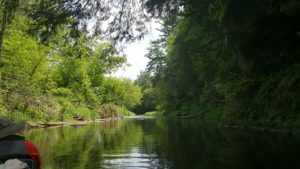 You can also camp overnight on the river in specific campsites. There is one campsite at Wildcat Mountain State Park, and further downriver in the Kickapoo Valley Reserve. There may be costs associated with camping or parking in parts of the river, so be sure to check ahead of time!